If you've recently decided to explore TV antennas and have spent any amount of time shopping around, don't feel bad if you are thoroughly confused because you are not alone. One of the most common questions we get in our call center is "How can I tell if my TV antenna is HD?" Here's the most important thing you need to know: there is no such thing as an "HD" or "Digital" TV antenna. The signals from your local broadcast towers are digital, as are the tuners in newer TV sets, but not the antennas themselves. You don't need a special kind of TV antenna in order to receive digital broadcast signals. You can use a TV antenna from the 1970s and it's going to pick up the same digital broadcast signals as any spaceship-looking, HD-claiming antenna you can buy today, so don't be fooled by the misleading and deceptive marketing claims. Lava brand TV antenna with 4K/HD claims. 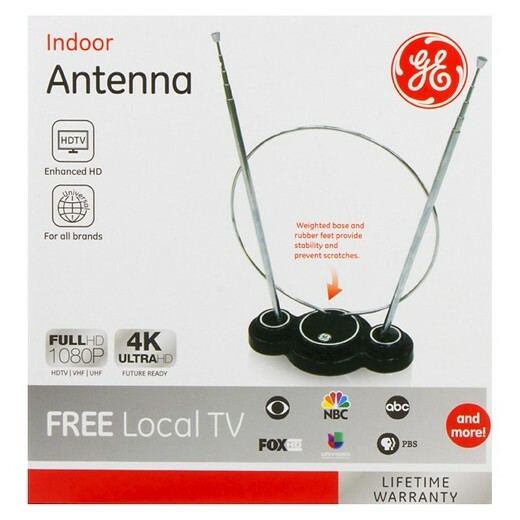 GE brand TV antenna with 4K/HD claims. 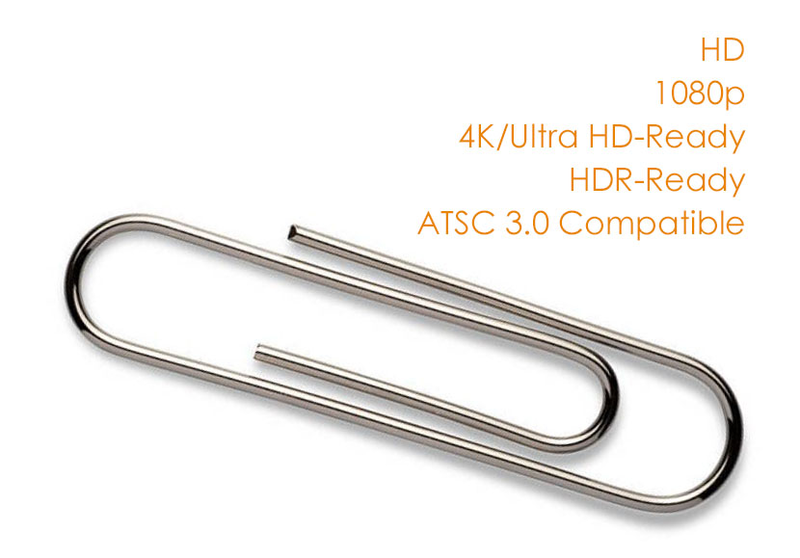 A common paperclip can receive the same broadcast signals as any TV antenna on the market today, just not very well! So how did all of this HD-labeling start? In 2009 a wondrous thing happened to over-the-air broadcast TV: the transmissions changed from analog to digital. This means that the free TV that you get from a TV antenna is now beautiful, crisp, uncompressed digital signals that are noticeably better HD quality than what you get from Cable or Satellite services. The 2009 digital transition is actually what started the cord cutting movement, when consumers began to realize that they could now get about 80% of the TV content that they watch (ABC, CBS, FOX, NBC, PBS, The CW and more) in gorgeous HD for free using a simple TV antenna. 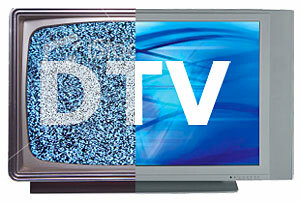 In 2009, broadcast TV signals in the U.S. switched from analog to digital. 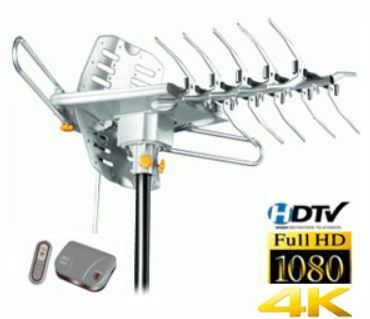 Foreseeing the inevitable boom in TV antenna sales, many marketers decided to capitalize on this trend by calling the antennas HD or Digital, implying that you must have this new, fancy, over-priced antenna in order to get the new digital signals. Hogwash. If you ask a manufacturer why their antenna is called an HD antenna, they will likely respond that it's because the antenna receives HD broadcast signals or that the antenna works with digital TV sets. Ok, that's true. But ALL antennas receive HD broadcast signals and work with digital TV sets, even the one mounted in your grandfather's attic. TV antennas provide a tremendous amount of value. In the world of TV, nothing else even comes close. Antennas may be considered old-school technology by some, but they are delivering a modern-day digital TV renaissance directly to your living room, and it's a glorious thing. Over-the-air broadcast TV is experiencing a renaissance, igniting a boom in TV antenna sales and competition among TV antenna manufacturers. Channel Master has been making TV antennas since 1949 and we see some truly crazy claims in TV antenna marketing today. Just remember, those descriptors are about the broadcast signal and/or the TV set, not the antenna, so be careful you don't over-pay for something that you don't need. When you're shopping for a TV antenna, the most important things you need to know are the location and distance of your broadcast towers from your home. Once you have determined those two items it's easy to choose the antenna that fits your needs. For assistance, check out our handy Antenna Selection Guide and channel-finder map.